Paul Santisi Empowermrnt Energy Tags "Magic In Physical Form"
EMPOWERMENT TAGS ARE IN AND GOING FAST! Only $49.77 each. Plus FREE Global Shipping! Includes a FREE solid stainless steel 30 inch chain! Includes a FREE rubber surround bumper! Includes a FREE CONFIDENTIAL Instruction Energy Card! YOU CAN HAVE YOUR VERY OWN EMPOWERMENT TAGS TO QUICKLY CREATE YOUR LIFE ON YOUR TERMS! You will take “COMMAND” and create your own “LUCK” and everything in your life. Take Hold Of The Very Same Secrets Of Self Empowerment That Those Who Always Seem To Be Lucky And In 100% Control Of Their Of Life Use To Create Their Future. Tap Into The Unlimited Benefits Of Emotional Power, Self Control, Manifestation And Knowledge That True Masters Of Energy Have Used For Thousands Of Years To Create Abundance! Tap Into The Energetic Power Of Intention Through Self Empowerment That Is Kept A “HUGE SECRET” Because Of It’s Amazing Power! You Will Gain The “MAGIC TOUCH”. Your Life Will Become Your Life For The Rest Of Your Life! Positively Impact Yourself And Everyone Around You, Amplifying Your Energetic Abilities Like You Never Thought Possible! Embrace And Release The Dormant Genius Within To Be The “CREATOR” Of Your Reality. You Are Moments Away From Becoming Better, Happier, More Motivated, More Empowered Than In Any Time In Your Life Up To This Point. You Will Be Your Own GOOD LUCK GENERATOR in all aspects of your life. Achieve All Of Your Life’s Desires With 100% Knowingness. Achieve All Of Your Life’s Wants With 100% Confidence. Achieve All Of Your Life’s Dreams With 100% Self Assurance. Achieve All Of Your Life’s Desires While Eliminating All Blocks. Achieve All Of Your Life’s Spiritual Connections. Achieve All Of Your Life’s Materialistic Wants. Achieve All Of Your Life’s Job, Business And Career Goals. Achieve All Of Your Life’s Need To Vibrant Dynamic Health. Achieve All Of Your Life’s Relationship Goals. Achieve All Of Your Life’s Desires With 100% Certainty NO MATTER WHAT YOUR PRESENT SITUATION IS RIGHT NOW! Get Ready To Experience Some Powerful And Positive Changes In Your Life!. Some of you will read this and your ego and beliefs will get in the way, you will just put this off as nonsense and not possible. You will say to yourself, how can a tag with a word on it bring me luck and activate something within me to create the future that I want? I hear you. I used to think the same way. When I did my life full of confusion and struggle. It was not until I dropped my pre-conceived assumptions and simply “duplicated” what those who had the life I wanted believed in and used as powerful to “tools” to speed up there manifesting powers. It’s easier than your led to believe. Believe me when I say YOU CAN DO THIS! No matter what your thinking I want you to know that it’s 100% fine with me. I can’t want something more than you need to want it for yourself. You see I know how well and fast these start to work when you “believe”. It will blow your mind how fast these empowerment tags begin to change how you feel about yourself. For 97% it’s virtually instantly! Just know that it’s never ever talked or publicized that energy and good luck pieces are considered “prized possessions” that are used by all the super successful and lucky people on planet Earth. Those who lives are full of confidence, happiness, manifesting power, financial abundance, dynamic health, joy, abundance, prosperity, luck and beyond. The truth is that none of these people will ever admit that something so powerful exists. They will lie to your face to keep their “SECRET” hidden from you and the rest of the world. While they live a life that 99% of other people only dream about! THAT IS ALL ABOUT TO CHANGE! How It Works…. You just watched the video that I made talking a little bit about how amazing these empowerment tags are. I revealed several SECRETS to you that went over most peoples heads. During that video I shared that the missing ingredient when creating good luck, financial abundance, manifesting powers, dynamic health, happiness, relationships, prosperity and beyond in life is intention. Without the right intention nothing you want happens accept more of what you don’t want because you are un aware of how to set a proper intention. Other wise you’d be doing it. Does that make sense? I hope it does. Then the opposite is true. When you have a special item or piece in your possession that has the power of intention. Created by a being who vibrates with a powerful frequency, for you to succeed and for you to achieve your goals and dreams. It virtually becomes magical in its abilities to empower the bearer of such piece. That everything that they desire to have be and do is 100% possible and simply a decision of away! These empowerment tags are unlike anything that has ever been created. Each one is super charged with the powerful intention and signature of myself for you become great! You will virtually feel it buzz and tingle with powerful, positive, vibrant and loving energy the moment you put it on. There is truly nothing like it anywhere in the World and these can never be duplicated by anyone. Tags are MADE IN THE USA! Tags are “diamond etched” for a beautiful finish and feel. Tags feel amazing with a level of class that goes with any attire. 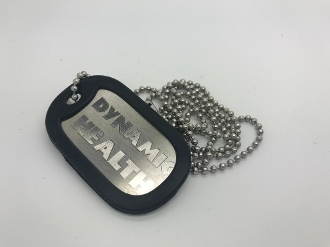 Tags come with a FREE 30 inch stainless steel chain. Tags come with a FREE black bumper. Tags come with a CONFIDENTIAL instruction energy card. Tags come with a 90 day unconditional money back guarantee. Price includes FREE AND FAST global shipping. Double sided with an empowering word on the front and on the back Paul Santisi's etched signature. With the inscription that reads, "this Paul Santisi empowerment tag releases your ability to clarify, define, and focus on your current emotional state of desire. I can’t wait to hear your very own personal success story! You know I love ya! "Note: no additional coupons or discounts can be used with empowerment tags. Copyright © 2007-2019 World Class Meditations By Paul Santisi. All rights reserved.